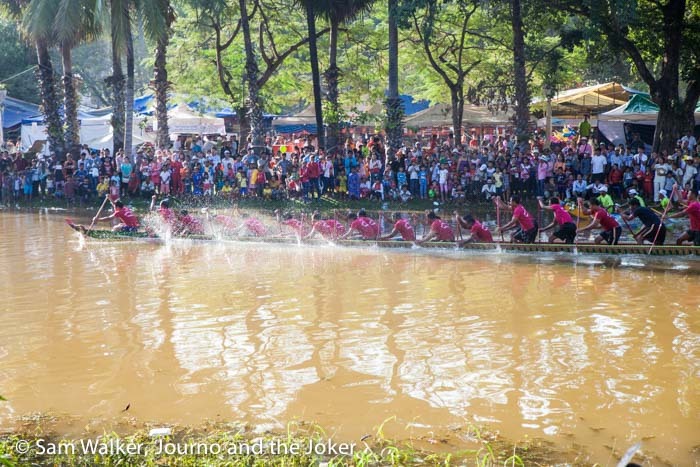 So, bon om touk – the water festival – is happening. And it’s on our doorstep. Pretty exciting. Our little neighbourhood has been transformed into a hub of activity. Traffic is chaos, roads are closed and street stalls are everywhere. Music thumps and booms from loud speakers, each stall competing in sound with it’s neighbour just metres up the road. Bunches of big coloured balloons are everywhere. The end of the street is blocked off to vehicles and a hum of excitement ebbs through the crowd. Everywhere there is an abundance of street food. It seems fairly floss and popcorn are universal in their popularity. All kinds of processed, unidentifiable foods are on display – I guess show food is the same everywhere – and all kinds of meats are being barbecued. 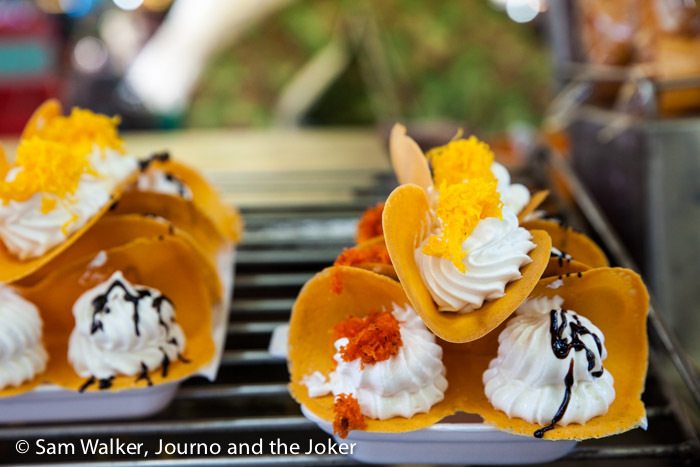 Street vendors are whipping up pancakes and other sweet delights and restaurants are taking advantage of the street traffic with special menus and barbecue take-away. Small, rickety ferris wheels are set up on each side of the river. They’re turning at such speeds the fragile-looking carriages are swaying wildly and the experience looks quite terrifying. Call us wimps, but we’re going to give them a miss. Some kind of a sideshow alley has been erected in the park on the west side of the river and people crowd around to throw darts at balloons in an attempt to win huge, stuffed toys. These sideshow attractions are set up between stalls selling mattresses, towels and washing detergent among other random things you wouldn’t normally expect to see at a festival. But one of the big draw cards is the boat racing. Everyone’s talking about it. Everyone wants to see it. Many teams enter in these awesome long boats, with 20 or more competitors in each one (apparently this is small compared to other regions). And the crowds line the shores to cheer them on. Government departments, private enterprises and NGOs enter teams. The finals are run on the second day of the festival. 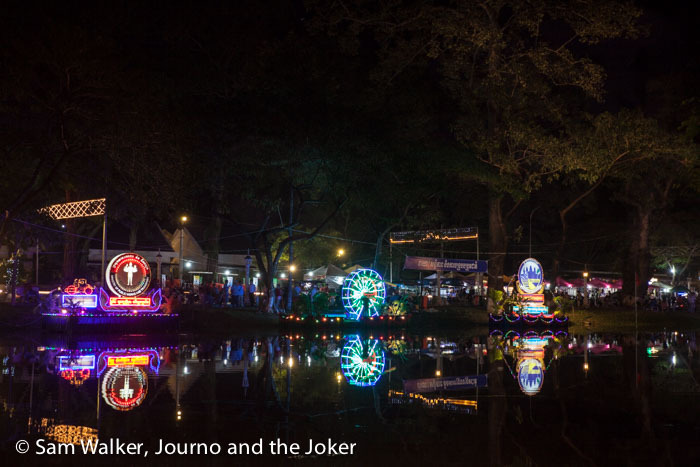 According to Tourism Cambodia, the Water Festival – Bon Om Touk – honours the victory of the Khmer navy during the Angkor period in the 12th century. Traditionally, it is also a ceremony preparing the armed forces to go into battle, because, centuries ago, many of the battles took place on water. Today, it seems to be a fun way to spend a three-day holiday and it attracts people from far and wide. 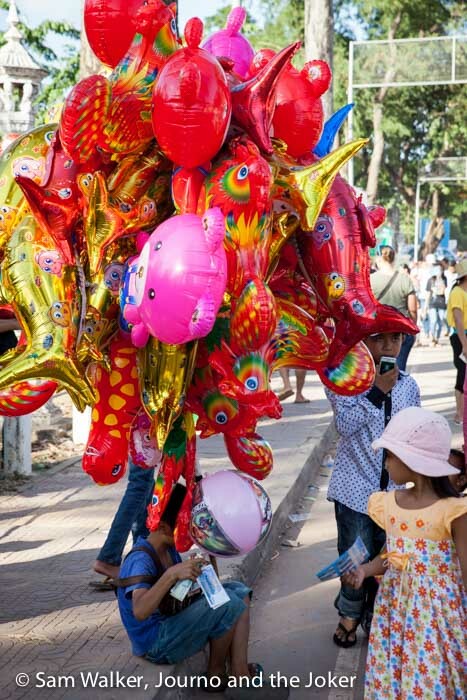 But the beauty of it, is this is predominantly a Khmer festival. This is not geared to tourists at all. And Cambodians are embracing it whole-heartedly. 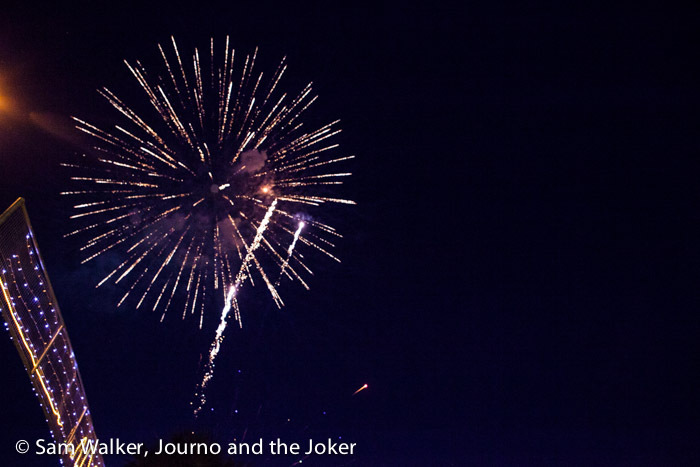 With the sun dipping below the horizon on day one of the festival and the sky darkening, the city suddenly exploded with a boom and a burst of colour as the fireworks display lit up the sky. I was caught unaware. And unprepared. No tripod. Bugger. So I improvised. High ISO and short exposures instead of low ISO and long exposures. It’s not brilliant but it is something. Hopefully there will be a repeat performance tonight and I will be prepared. I’ve even got a cool location in mind. With the fireworks display over the crowds returned to the stalls and festivities and the river reflected the festivities in its murky surface. 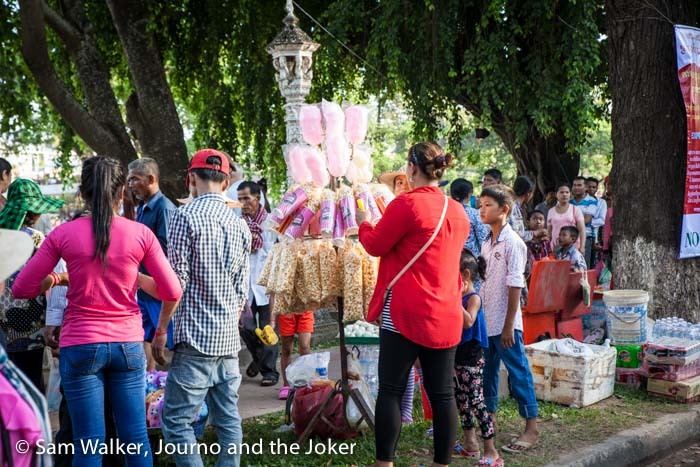 To all our Khmer friends, happy Bon Om Touk. Enjoy the last days of the water festival. I don’t know what you’re doing for the afternoon but we’re off to join in the celebrations and experience more of the exciting atmosphere and events taking place down the road. Happy Hump Day people.